A self-motivated Telemedicine Network Manager and has work responsibility to design, operate and support telemedicine technical network of SGPGI with various nodes involving India & Overseas. He was involved in various telemedicine research and development projects in India and overseas since 2004. Currently working in National Medical College Network (NMCN) Project at National Resource Center, School of Telemedicine & Biomedical Informatics, SGPGIMS, Lucknow supported by Ministry of Health & Family Welfare (MOH&FW), Government of India. He was also Involved in International Projects like WHO-DPR Korea Telemedicine Project in 2008 & IHDP-World bank Project in 2008 for establishing telemedicine Network. 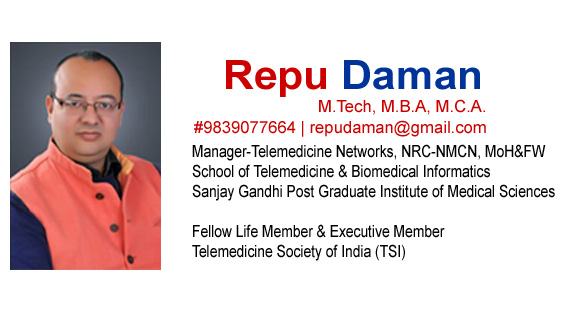 He is a Fellow Life member & Executive Member of Telemedicine Society of India (TSI).